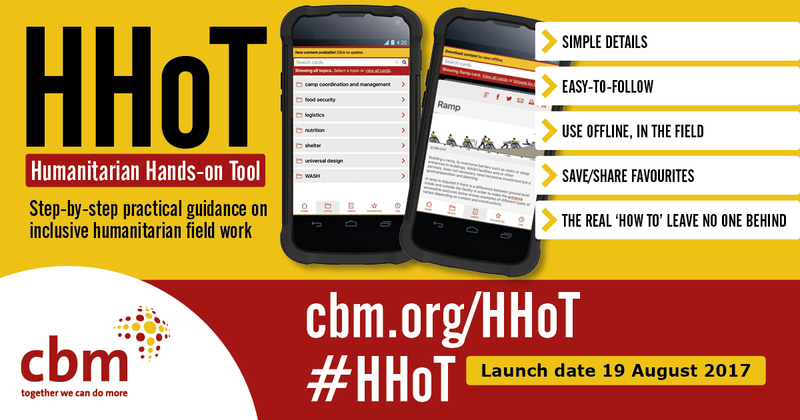 CBM’s Humanitarian Hands on Tool (HHOT) is a ground-breaking mobile app to help people with disabilities access life-saving relief services during emergencies. During any emergency or disaster, people with disabilities are some of the worst affected but often find it difficult to access relief services. This custom mobile app, provides practical, step-by-step guidance that emergency workers can access freely and easily to ensure that the help they provide, such as emergency shelters or food and water points, are accessible to people with disabilities or other marginalised groups. The fully accessible app, developed with Cambridge-based digital agency Studio 24, can be downloaded to any mobile device and is then available without internet or mobile connection. It updates automatically on reconnection and input and feedback is invited from users to ensure the tool grows while staying focused, relevant and up-to-date. The content is easy to navigate and is grouped into relevant topics such as logistics, shelter, nutrition, etc. Both people with disabilities and agencies providing emergency relief have been involved in providing inputs and feedback ensuring that content is relevant. Further work will continue on the tool, including translation to other languages, incorporating mental health support and inclusive disaster risk reduction.